On a Saturday at the Pacific Science Center in Seattle, Wash., life-size robotic dinosaurs roar. A giant video monitor shows a person sneezing as a spray of mist shoots down from the ceiling. Nearby, naked mole rats scurry blindly through a maze of tunnels. And since it’s all mud and rain outside, the place is packed with curious children and adults trying to keep up with them. Loud noises, bright lights, crowded spaces: This is exactly the situation Mike Hiner tries to avoid with his 20-year-old son Steven, who is autistic. He’s one of the many children and young adults in the Northwest who have some form of autism spectrum disorder, or ASD: In the Seattle School District, 10 percent of the special education population has ASD, and in nearby Bellevue, that figure is 17 percent. And because overstimulation can be painful for children with autism, many parents with autistic children avoid crowded, sensation-filled situations altogether — which can mean missing out on fun outings. 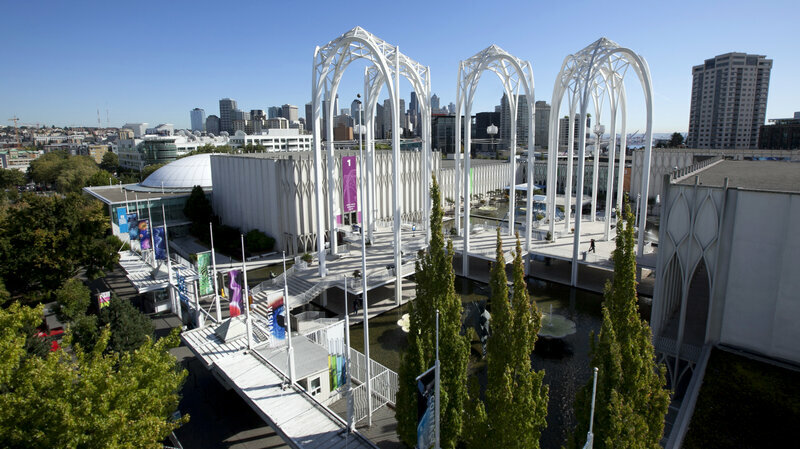 But some museums, including the Pacific Science Center, are recognizing the problem, and toning down the sights and sounds. One Saturday each month, the museum opens up early for families with ASD — like the Hiners, here before official hours begin. For two hours, the lights are dimmed, the loud noises are turned down and there is room to move around because it’s less crowded. Mike Hiner says he wouldn’t have come here with his son during regular hours. For families with kids with autism, maintaining the requisite quiet and calm can be limiting, and lead to feeling a little isolated. The Pacific Science Center’s Renee Gervais says the whole point of opening up early on these Saturdays is to offer more access. “What we want is to be able to provide our programming, provide these experiences for children who may love them, who may be able to kind of run with them, who may become very inspired by that interaction,” she says. Other museums and organizations across the country have similar programs, from the Smithsonian in Washington, D.C., to the Dallas Museum of Art. Even NASCAR holds events where autistic children go to the track to watch a live race from a quiet room. Inside the butterfly house (the place Steven didn’t really like) unpredictable, electric blue and yellow flying insects land on tropical flowers for a quick snack. Eight-year-old Desmond Tsai takes it all in. Jeffrey Eckenroade, a docent, introduces Desmond to the heavy scent of gardenias and Jasmine. “What does that flower smell like?” Eckenroade asks. Desmond’s father, Gordon Tsai, says his son would never open up to a volunteer like this if it were loud and crowded. The two hours go by fast and 20-year-old Steven Hiner has had a great time. His sister Elizabeth helps him recap the highlights: the dinosaurs and the puzzles. “They’re good,” he says. And with that, Steven hops onto his sister for a piggyback ride to go check out the planetarium.